Expanding upon the last post, the "sunspot integral" (accumulated departure in sunspots v. the monthly mean of 41.2 for the observational period of sunspots 1610-2009) shows good correlation with the temperature record. Excellent correlation (R²=.96!) with temperature is obtained by adding to the sunspot integral the most significant ocean oscillations (the PDO-Pacific Decadal Oscillation + AMO- Atlantic Multidecadal Oscillation*3). Various other combinations and permutations of these factors compared to the temperature record have been posted at: 1 2 3 4 5 6, although I have not located others with a correlation coefficient of this magnitude. Contrast the R² of .96 from this simple model (near a perfect correlation coefficient (R²) of 1) vs. the poor correlation (R²=.44) of CO2 levels vs. temperature. What does this model predict for 2100? 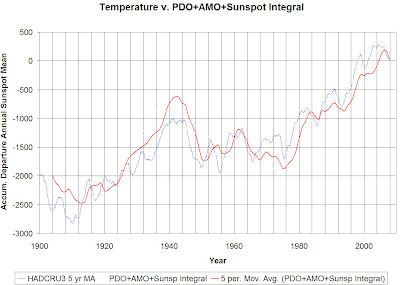 How predictable are PDO and AMO 100 years into the future?? Obviously sunspots aren't predictable 100 years ahead, although you could probably have a shot at it for the next 20 years. Would be worth seeing your models based on reasonably predictable oceanic parameters and a variety of sunspot cycle scenarios (Dalton minimum followed by stronger cycles; Maunder-style minimum until 2100; repetition of 20th century solar output). But what in hell drives the AMO and PDO? My model (not me) would predict that climate will follow the Sun as it has over the entire 140+ year record of thermometers, and using the full extent of the Y-M Wang’s three-century, state-of-the-art model for TSI, and blessed by IPCC. That prediction is quite comparable to IPCC’s estimate of global average surface temperature smoothed with a 30-year filter, the nominal minimum climate span. If AGW is present, it must be affecting the Sun! All climate science needs to do to predict Earth’s climate is to predict the Sun’s output. Greg says: December 28, 2013 at 11:58 pm lsvalgaard says: >> geologyjim says:”does not answer my question about the RATE OF CHANGE.” Becasue the Rate of Change is not important. The amount of energy output is. Indeed , so “activity” probably needs to be integrated in some fashion to get energy. Simply integrating some measure of activity over all time would not be reasonable since as the Earth warms or cools in response to a changing input there will be tendency to return once the perturbation ends. If climate has linear relaxation response to such perturbations the Laplace response will be convolution with a decaying exponential. That is basically a weighted integration. As an illustration SSN is integrated with 20 year time constant response and compared to low-pass filtered SST. Hello? Anyone home? Are you going to back up your graphic with links to the datasets used, or not?? It's The Water Vapor, Stupid! "2 climate studies offer hope on global warming"
Can Climate Change Forecasts Still Be Trusted? You Just Can't Win Dept. Why hasn't Earth warmed as much as expected? Out Mann-ed: Tree Rings "Uncontained"